Artspot always has something interesting cooked up for Third Thursday / each month / year round/ Always 5-8pm. click here for the art walk map! We promise to introduce you to a talented local artist doing interesting things and often will have a few cool art materials out for you to try. Come SEE! We support local artists with excellent service and quality pigments and materials! “Art for All” will be here at ARTspot for Edmonds Art Walk. This very special group of artists have been painting peace poles for a really cool installation project happening on April 20th at the Graphite site just down the street at 2nd and Main. They’ve made a few extra peace poles for us to paint too! Come by ARTspot for Edmonds Art Walk. Meet the Art for All group, and paint on one of the Peace Poles they have prepared for us! Bring seeds and plant starts for the installation if you can. About Art for All: We are a community based group of artists in the greater Seattle area endeavoring to connect artists with disabilities to opportunities to make and exhibit their art. We meet quarterly at various venues in the greater Seattle area to plan connect and dream. We have developed strong connections in the art community, namely with exhibits and events at the Schack Art Center, Art Spot, Edmonds Art Walk, Redmond Arts Festival, and Phinney Ridge Art Walk . Art For All Forum is doing an art instillation in honor of Emily Locke in Edmonds on April 20th at the future site of Graphite 202 Main St. Edmonds. It will be a temporary instillation on the lot. We are hoping to have friends/ local artists help in any way they might like. We are planning to do a garden in pots painted by our artists with disabilities and plant seeds and plants from local gardens. We also make peace poles to stick in pots and around the site. We want to create a vision that speaks of the artful and life giving person that Emily was. Any help with painting pots or cutting wood or making garden art to put in and around the instillation would be awesome!! Also any gardeners with seeds or divided plant starts etc. would be awesome. Art for All artist making her Peace Pole for the installation at the future site of Graphite, 2nd and Main in Edmonds. Coming up at art spot! Doug Loftstrom - Paints BIG & Bold. Come be inspired. Dog days of summer fundraiser for paws animal rescue. It’s an annual event! Mark your calendars for July 18, 2019 for pet portraits by local artists. Another great night to raise $ for our local animal rescue! July 18 will be our 3rd annual Edmonds Art Walk: "Dog Days of Summer" Pet Portraits to raise money for PAWS. This event has become an annual event for pet lovers here at ARTspot. Past artists who volunteered their time were Mike O'Day, Cody French, and Julia Carpenter. We look to announcing the 2019 lineup of artists who will be sketching portraits of people's happy pups. Stay tuned! Thank you also to all the folks that came last year with their pets, or photos! We enjoyed meeting each and every one of you! Designed and Illustrated by Bryn Fraker. 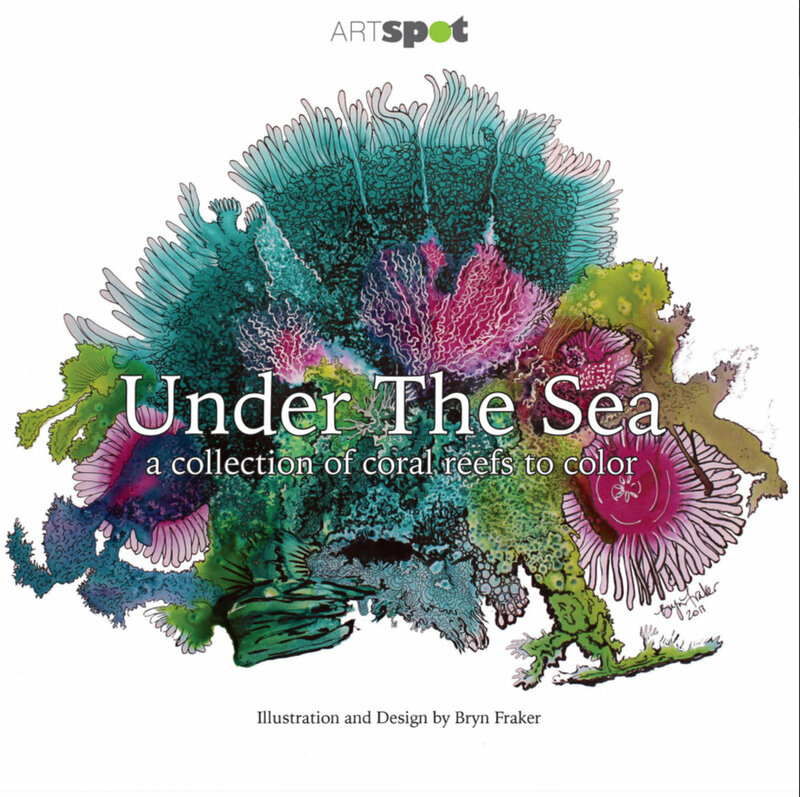 ARTspot's first original coloring book designed and illustrated with the amazing coral reef drawings of Bryn Fraker. 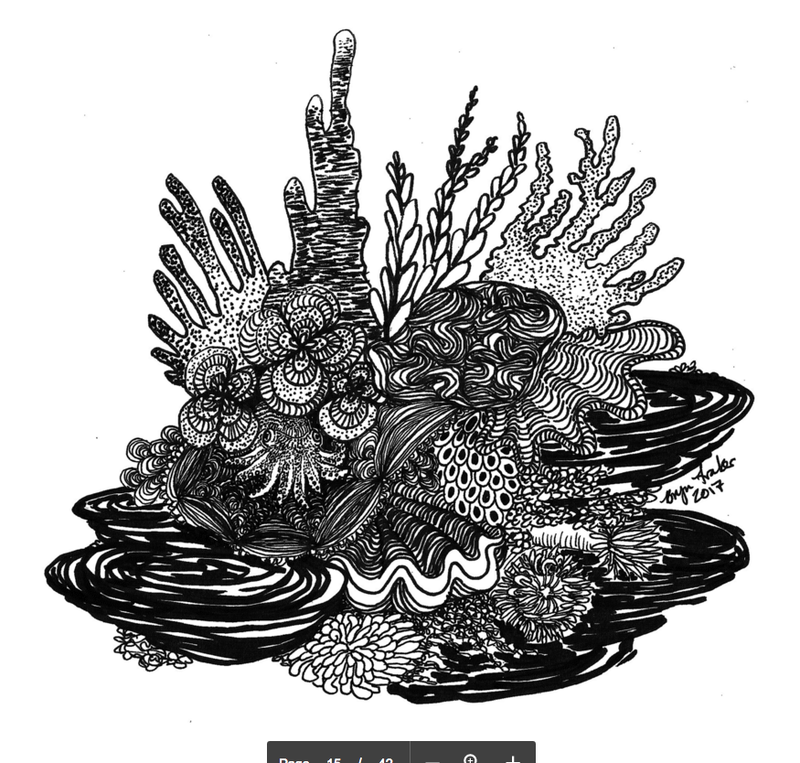 The coloring book craze continues, and Bryn's passion for marine biology inspired this book. Every purchase will result in a donation to the Coral Reef Alliance. Coloring Books are 8'x8' with 18 illustrations to color. Available now only at ARTspot for $11.95 -OR- Click here to order a copy! ARTspot joined Edmonds Downtown merchants in raising money for Washington Kids in Transition. We raffled off a basket overflowing with art supplies. We raised $140, and the event earned $1,200 total to help out homeless kids in the Edmonds School District!. washingtonkidsintransition.org. ARTspot window display featured 20 paintings made during last years Creative Connection event for disabled youth and their families. Sales of these paintings went towards sponsoring the event for this year. over $200 raised for the "VOICE" Program! Thank you everyone who purchased art to support this special group of artists! Thank you Mary Peterson for all you do in the community, making the Creative Connection happen, and for making monoprints during February art walk with Edmonds art walk visitors! ARTspot donated canvases and we raised over $200 from sales of the wonderful art the kids made for VOICE (Vocational Opportunities In Community Experience) program! "Nasty Woman" Pendants made lots of people happy at the March Art Walk and sales went to our local YWCA, working to support women and children in our community. Thank you Barbara Wyatt for making and donating your time to a great cause. Barbara is a very talented, local artist and very good friend of ARTspot. Barbara is one of the most versatile artists ever! She is always learning and teaching new techniques. When she decided to go to the Women's March in Washington DC this January, she went into production mode making these delightful "Nasty Women" pendants. It seems she could not make enough of them, as so many women who saw them wanted one! This month's community fundraiser was for the YWCA. This organization helps homeless women and children in our community. Look who showed up to paint!.... Tracy Felix (far right) with members of the board from Washington Kids in Transition at the 2nd "Paint-Together session April 11th. Over twenty artists got together this month to paint life affirming, uplifiting art. The 10x10" paintings created at the "Paint-Together" sessions were revealed in the front windows of ARTspot for April's Third Thursday Art Walk. Folks came in to purchase the art through May 1. 100% of proceeds from artist fees and the purchase price of $50=$150 went to washingtonkidsintransition.org. We raised almost $1,200 to help out homeless kids in the Edmonds School District! Heart Spot's May Art Walk event raised $200 with the help of artist Cody French's "Sweet Show!" Everyone enjoyed both Cody's funky crazy ice cream cone sculptures, and the scooping of real ice cream to kick off summer. It felt great to raise money for Doctors Without Borders. June 2017 ARt walk: ART Rocks! A little over a year ago, you may have noticed colorful rocks showing up in the most surprising places around downtown Edmonds. ARTspot was interested... and with a little detective work, and talking to some of the Mom's coming in to buy acrylic paint at our art store, we discovered "Edmonds Rocks." A group of Moms and kids have been painting rocks, and hiding them with the express purpose of surprising and delighting anyone who either want to just admire, or even keep them as a found treasure. For June Art Walk Edmonds, we set up a project table for anyone who wanted to take a little time to paint a rock. We supplied the paint and brushes. Thanks you to the "Art Rocks" group here in town for bringing rocks to share. Thank you to all who brought a donation for the Edmonds Food Bank.